When your computer is switched on, the first thing the motherboard does is run a Power On Self Test, or POST. This is run by the BIOS (Basic Input Output System) on the motherboard, not by Windows – Windows hasn’t even started to load yet. If there is a problem with say faulty RAM or graphics card, then the motherboard will start beeping at you – because if there is something really wrong, it won’t be able to get far enough to even say anything on the screen. Obviously the first thing to do is to check everything is plugged into the motherboard correctly. Pro Tip: If this is an in place computer and nothing has changed, remove and re-seat the RAM and (if needed) the graphics card. It’s amazing how many times this fixes it. I have had several computers that at the start of every summer would stop working, beep madly, and just wanted their RAM taken out and put back in again. 2 minute fix. There are many different motherboard manufacturers – like Gigabyte, Asus, ASRock, MSI, etc. 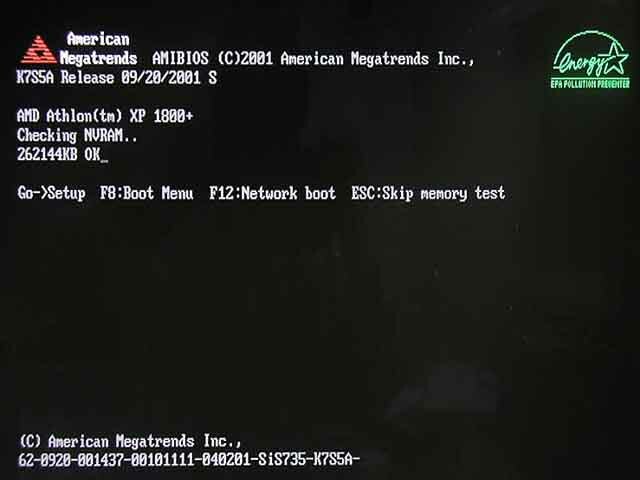 But it doesn’t matter who made the motherboard, or whether you have an Intel or AMD CPU, there are only two major companies who make BIOS chips – Award and American Megatrends Inc (AMI). 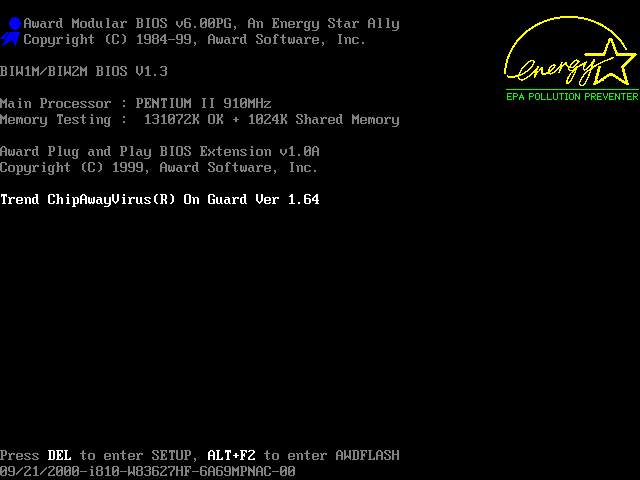 Even branded computers like Dell and HP still use Award or AMI Bios. Sometimes you will see one of these names when your PC first powers on. Brand name PCs usually have a full screen logo, but if you press Escape, Tab, F1, F2, F10, or Del, you should catch a glimpse of the actual start up screen (or go into the BIOS). If you see the real start up screen (like the images in this article) you may see one of the logos – it’s the very first thing in the top left corner of the screen, and it’s either a blue ribbon for Award, or a red pyramid for American Megatrends. If you can’t identify whether it is AMI or Award, you might be able to tell from the beep code – they only have a couple in common. If there is more than one problem, the beep code will be the first one it checks, usually in the order show below. So sometimes you fix one thing and then there is a new beep code indicating a second problem. No Beeps and Not Working? If the computer does nothing and no beeps, unplug all the extras connected to the motherboard – like Hard Drive, CD ROM, Graphics Card, as well as any external peripherals (but leave the power connectors and the front panel ports and all that connected to the motherboard). You should get a beep or lack of with nothing more than a motherboard, cpu and RAM. If you don’t then it is one of those three, and I’ve only seen a dead CPU a couple of times out of thousands, and only then when the motherboard was dead or the CPU fan was dead. CPUs are the least likely to fail. RAM is pretty good too – again, only a few times has RAM been the culprit. So basically if you can’t easily replace the part or get any beeps, it’s probably the motherboard – and they fail all the time. If it looks OK with with the motherboard, CPU and RAM, then add Graphics card, HDD and CDROM (in that order) back in again one at a time, testing each time. Swap for different ones if you can. Also swap cables like SATA cables if possible. One cause of inconsistent errors is overheating. Fans are about the cheapest part inside a PC box, and they are one of the most vital. With some PCs the cooling is marginal enough that they won’t even run with the side cover removed. If it boots after being left for a few hours, but then fails to reboot, it is probably overheating. Blow out the dust (air compressors are great for this), check the CPU fan and whether the CPU heatsink is firmly attached, and replace case fans (or add another case fan). If your errors are inconsistent – like sometimes it boots, and other times it does nothing – it could be a hairline crack in the motherboard. This is especially noticeable when the PC won’t work standing up, but when you lay it on its side to open the case and fix it, all of a sudden it starts working again. Good chance you have a motherboard with a hairline crack. I have heard of people putting motherboards in the oven to try and get the solder to repair, but once you are resorting to this you are better off just buying a new motherboard, which almost always means a new PC. Because New motherboard = new CPU and RAM due to the fact that the only motherboards you can buy now won’t take your old CPU or RAM. So you are halfway to the cost of a new PC – only a case, graphics card, HDD and CDROM to go – and most of those you can recycle from your new boat anchor dead PC.